Since the Harlem Collective began hosting art and jazz events back in the 1920s , the love story between jazz music and contemporary art has given rise to many exciting collaborations, exhibitions and events. Successfully crossing the pond from the Big Apple to Europe, greats such as Picasso, Picabia and Van Dolgen connected with the new, exciting sound. Jazz’s unique blend of primitive and exotic, inspired artists and accompanied the new artistic movement. In 1925, France’s Paul Colin released a series of posters, entitle ‘La Revue Nègre’, which might raise a few eyebrows now but smashed taboos at the time by publicising Black Music. In 1945, Matisse published his ‘Jazz’ collection; 20 colourful collage prints that marked the artist’s shift to a new medium. Where better to host an exhibition dedicated to the art [et] jazz story, than the town deemed by Dalí to be the centre of the world? A cent mètre du centre du monde (100m from the centre of the world) is a contemporary art gallery, you guessed it, 100m from the Dalí-inspired train station in Perpignan. 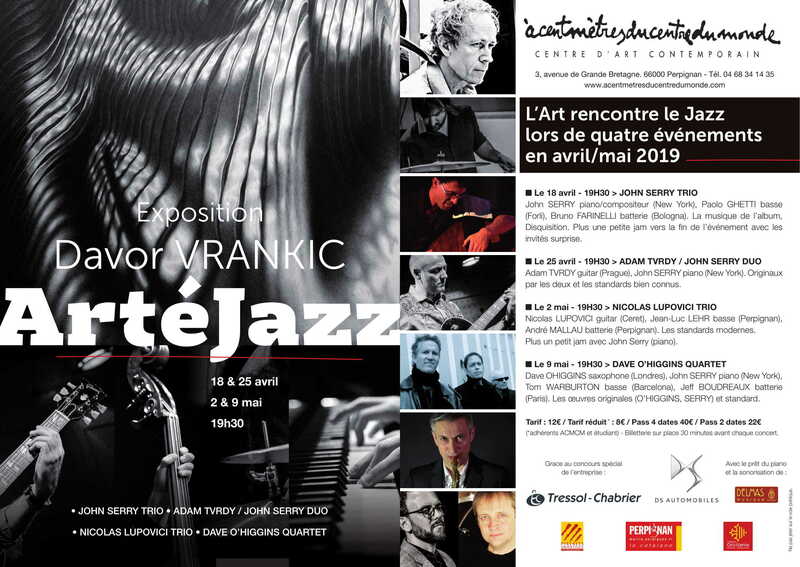 This renovated warehouse boasts 1400m² of exhibition space and is proud to host the Artéjazz Festival, conceived with Grammy Award nominated New York pianist and composer, John Serry. 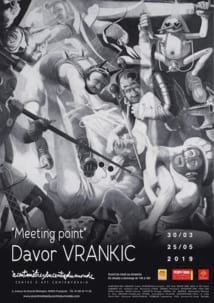 ‘Meeting Point’ is a collection of lead pencil, large format drawings in black and white. Close to photo-realism, in a single space, Vrankic’s works confront all his visual experiences, from classical painting to video, from photography to engraving. The mystical grandeur of the Flemish or Spanish masters merges with underground and popular references in this apocalyptic and twilight reality. Modern jazz classics and a short jam session with John Serry. Original compositions from O’Higgins and Serry. A New York native, lived and played in some of the most glamorous cities. Why Perpignan? Things change depending on one’s phase of life. In general, I like medium cities better now. The big city, big scene – I did it already. Most composers build on those who came before and these influences show up quite clearly. Your music is light yet incredibly rich with no discernible influences. Who or what inspires you? Hmm, the critics have always found my influences – Chick Coera, Herbie Hancock, Keith Jarrett, Bill Evans and more recently, more obviously, John Coltrane, McCoy Tyner – and not yet noticed, but huge for me, Wayne Shorter. The more advanced listeners hear my classical music influences – from Bach to Beethoven to Chopin to Stravinsky, Bartok, Hindemith, Copland and so many others. Of course, I am also a classical music composer. Regarding the assertion that my music is “light”: it used to be more complicated and, paradoxically, lighter. Now it is less complicated and, I am pretty sure, deeper. Music lives so it evolves, what is in your opinion the most important evolutionary driver?— It should be creativity, but lately (for about the last 39 years) the driver has been a wrong-headed jazz politic and the marketing machine/corporations that proliferate it. Jazz is a broad church and labels can mislead however how would you describe your music? Unaffected by marketing trends, always evolving by my learning, incessantly, new things. It is, of course, modern jazz, in every sense of that term. Bass, drums and you on keyboard is your signature set up. Was that always the case? No. At Youtube one can hear my two early albums (Exhibition, which led to my being nominated for a Grammy and Jazziz, which received wide critical acclaim including 4 stars in Down beat magazine), both featuring a stellar septet of now very well known players, with plenty of overdubs as well. There are guitars, even two basses at the same time, synthesizers, multiple woodwinds and tons of percussion instruments (I am also a conservatory trained percussionist – I even play drums and all the instruments on 1 track of each album). Then for a long time (including on my 3rd album, Enchantress), I played always in quartet (sax and rhythm section). Now, and since about 9 years, I only like to play in trio. It is a perfect triangle, transparent and very interactive due, in part, to the reduced formation. Acentmetresducentredumonde is an extraordinary venue, did you find them or they you? I don’t remember – this is another aspect of the later phase in life that I alluded to earlier. However, I did play a concert there last year and that led to my being asked to organize a series of performances for this year. Hence, ArtéJazz.